A group with an apparent interest in land speculation, with the dignified sounding name of The Committee for Melbourne, is pushing a crude barrow to get elderly people to give up their homes. It wants them to agree to be rehoused in high-density apartment blocks and thinks that if the State government lets them pay less stamp duty, they just might be tempted. This was the subject today of an article by John Masanauskas in the Herald Sun, "Lobby group calls for older couples to give up family homes," 17 February 2011. It is probably not coincidence that, at the same time, Boroondara Council is trying to force 48 so-called "activity centres" (i.e. high rise developments) on its protesting residents. In a hangover from the Brumby government's human sardine policy, the council hopes to attract some of an additional 17,600 people that a few business hopefuls have promoted as likely to arrive over the next 16 years, based on shaky statistical projections. Bernard Salt, the well-known KPMG spruiker for population growth and megacities, and the CEO of the Committee for Melbourne, Andrew McLeod, have managed to leave some unfortunate quotes for posterity. Herald Sun writer, John Masanauskas, gives the impression that Salt believes that middle Melbourne (whatever that is) is fraught with the probability that "dad's going to drop dead and mum's going to be living by herself in a three-bedroom home". Salt predicts that the iconic 'mum' will eventually "find that the three-bedroom home with a garden and lawn becomes too much for her and she will therefore want to downsize." "If they are an empty-nester living near a school they are actually taking a role that from a society's perspective would be better taken by a family." You get the picture. According to this kind of view, societies and their suburbs should be reorganised into age cohorts. None of this bowls club down the end of the street and the little old lady in the corner shop, or the old man sitting on his porch in the sun, surveying his tomato patch, and the children visiting the lady over the road to climb her mulberry tree and use her grown-up daughter's books and toys, while their mother heads down for a game of tennis and their father takes the dog for a long walk up to the top of the hill to watch the sun set over the bay. Salt and McLeod seem to have an odd and naively statistical view of societies, where people are labelled according to some of their qualities, like cards in packs, and are okay about being moved around in a kind of Lego world on the whim of some boys who never quite got over playing Monopoly. "I think the rhetoric from Bernard Salt and Andrew Macleod that widows and "empty nesters" should leave their homes" and move into apartments for the convenience of others who would like to buy their houses is opportunistic , sexist, vulture-like, devoid of compassion or understanding, and the language of Grandpa and Grandma and (quote Bernard Salt) "rattling around in their veneers" is belittling to ordinary people. "I wonder what the adult children of these targets of the hovering developers and real estate agents think of this blackmail? I also wonder if Salt and MacLeod think widows Jeannie Pratt or Elisabeth Murdoch should vacate their premises for a flat in an "activity centre" or is just people who inhabit more modest post war triple fronted accommodation who are being asked to move over ?" "Behind the figure of ridicule, the widow, whose husband has "dropped dead" is a person in shock, in grief and who is making a huge adjustment to a major life-change. "The widow is extremely vulnerable and could well fall prey to the kind of persuasion and pressure that Macleod and Salt seem to want to institutionalise so that everyone these people meet will echo the same refrain. 'Don't rattle around in the veneer, it is your civic duty to move out of your house now and let a young family with children at Lauriston and Camberwell Grammar move in.'" "I wonder what Barry Humphries might say about this. He ridiculed the Australian suburban lifestyle for decades but I don't think he ever seriously thought of disrupting it and breaking it down." What next? Will Mr McLeod and Mr Salt be investing in cemeteries and urging everyone to buy vertical plots in order to squeeze more coffins in? With the baby boomer curve on course to crash over the next 20 years, it's a sure thing. Planning Backlash is the name of an umbrella group under which many different suburban groups gather to protect the rights of citizens whose environments and properties are threatened by intensification of development and the population growth that drives this. Mary Drost is their main spokesperson. Mary says that all of Melbourne will be affected by this population growth and overdevelopment if the Boroondara Council gets away with it, and that the local people are furious that Booroondara Council is continuing a densification plan dating from when Justin Madden was Planning Minister under the Brumby government, which lost power in the last election. Densification will wreck the area, she says, and Planning Backlash is appealing to their State Member, Ted Baillieu, for help based on promises he made before the election. Mary is actually pictured in John Masanauskas's article in a photo by Ben Swinnerton (which I have cropped above), leaning, smiling, over a picket fence, with a large sunny garden behind her. "Both Andrew McLeod and Bernard Salt are obsessed with growth. It is exactly this growth that is making Melbourne less liveable as everything is overstretched. Their obsession is taking them to new boundaries, now they want the older people to get out of their houses to make way for the next generation. Maybe they want to euthanase us as well. I am not going to be stuck in a dog box to keep McLeod and Salt happy!" She adds, "They would have done well at the time of the Russian Revolution, move the mobs into the big houses and let the owners live in one room. How would the grandmothers look after their grandchildren in dog boxes? What a nerve!" As her own lifestyle shows, everyone is not a poor old used up mum or a dad pining away without purpose. For years, in a tradition starting with her mother, young couples have been living rent-free in a little flat that Mary's husband and she had made at the side of the house. In this way they "get a start in life." In return they help where they can. "People usually stay about three years and then get their own place, after they have saved a deposit," Mary said. "Sometimes our guests have been young couples who were relatives." At the moment, she is sharing her house with one couple, who "came back for a while." In the flat on the property there is a second couple. She thinks and I think that this is a good way to use property. But it's not what Salt and McLeod would want, because their objective is to increase property turnover. Their guiding principle is commercial, not social. Mary says that her brother and his wife, who have grandchildren, could not do without a big house, as they are "forever having children coming to stay and the families come home for dinner sometimes twice a week." "What nonsense to say that we should all be moving into dog boxes," Mary exclaims. "Some no doubt want to, but I tell you this, it is the quickest way to give up and age and die. If you want to stay young then stay active. Don't forget that the government wants people to age in place and not go into nursing homes. The Dutch do this very well Australia should learn from them." Ironically, Bernard Salt, who looks to be over sixty in his photographs, actually lives in a heritage house a couple of blocks from Mary. We googled the address we were given and provide a picture above. We have removed the name of the street from the picture. Candobetter.net doesn't believe in exposing peoples' addresses unnecessarily, but it does seem on the face of it that Mr Salt talks the talk but doesn't walk the walk, and it is of interest to those dealing with the impacts of his marketing to see where he is actually coming from. Since her photo and some comments appeared in Masanauskas's article, a number of people have looked Mary up in the phone book and have called her, agreeing strongly with her defense of her right to remain in her home. After an unsolicited comment which complained about this exposure of Mr Salt, we canvassed our editors and writers who all agreed that it was relevant to show how Mr Salt lived. It was felt however that the important thing was to convey how he lived, which should include the suburb (of which it seemed typical, and which was the same suburb as Mary Drost's), but not necessarily the street. Therefore we have reduced the information on the photo. Discussion welcome. 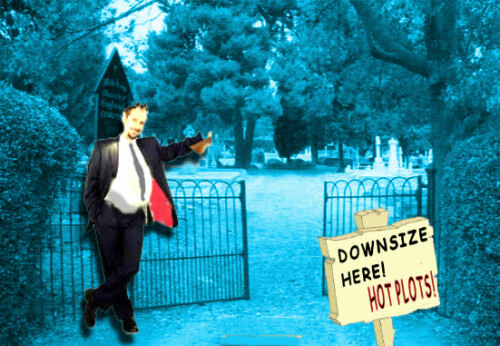 Love the pic 'Hot Plots' - Yes, Say NO! To Hi-Rise Rat Holes!!! I've seen some of these hi-rise cubicles - many without even a balcony to relieve the impression of imprisonment. Studios , they are touted as. A room with a bed and whatever else you can stuff in the room. These' horrible, often dingy and miserable catacombs are selling for over $200,000. I should know: I worked in real estate -briefly. If one wants a one-bedroomed 'apartment' - expect to pay over $300,000 - and probably without even a car space - although you might get a squishy little balcony in which to grab some real air! If you see a real estate agent with a brochure or get invited to a real estate Talk Fest banging on about the benefits of squeezing yourself into an early, living grave in order to pave the way for some self-centred youngster or greedy developer - slam the door or run as if your life depends on it. Your (Quality of') life does ! What's in it for the widow? The thrust of Andrew McLeod's and Bernard Salt's streams of consciousness are that ordinary Australians have a moral and community obligation to leave their homes thus liquidating probably their most valuable asset- for the sake of people to whom they are not related and who they do not know. Selling a house is a business transaction normally undertaken at the seller's convenience and in exchange for the maximum amount that can be fetched for the property. Salty and Cloudy appear to be trying to inculcate a new strain of political correctness and social pressure that it is good manners to leave one's house at the convenience of others who have been champing at the bit, waiting for an unpleasant change to someone's circumstances. Such changes of circumstance make people vulnerable to selling at a time which may not be optimal for them. In the dubious "reasoning" of Salt and McLeod, there is a community obligation on the part of the widowed more often than not female but is there any mutual obligation ? Having moved out of their house to accommodate unrelated strangers is there an obligation to the widow on the part of the new family moving in ? e.g promising to move on when her children or grandchildren need the same accommodation? There was a suggestion that stamp duty which is now crippling because of the inflation of property prices due to excess demand due to population growth, should be reduced for altruistic vendors such as the widow . How lovely! Would this amount saved make up for increased value of the house forsaken by the person's estate over say 10 years? Since these commentators speak for the growth lobby they must be hard nosed and they need hard nosed reasoning thrown back at them. Coincidentally, Kevin Rudd and his wife have just bought a massive, opulent, luxurious "holiday" house on the Gold Coast. It has all the excesses of Magabe's mansion, and more. Due to his support of "big Australia", more people have become displaced and homeless, and suffering from mortgage stress. Not only that, there are homeless people in Queensland due to the floods. While the general public are supposed to downsize, and accept smaller living spaces and apartments magnanimously for the greater good, we have our growth-pushing leaders leading the race for upgrading and adding to their expansive wealth. Rudd said in a statement in 2007 that he and his family had stayed at the house several times. "We liked the house and were interested in whether we could buy it one day." According to his story, he was made homeless as a child for a short while and had to live in a car. This experience has obviously not taught Rudd and his family any lessons in empathy or social justice! I calculated that the house indicated above is sitting on 0.22 acres about 900 sq metres, just shy of the classic 1/4 acre block. Bernard should be compelled to sell his backyard and frontyard to make room for a younger generation, and also lease out those extra spare bedrooms to accommodate population growth. Note that many new estates on the urban fringe make do with only 300-400 sq metres. So you would think that people in high amenity areas of the inner suburbs of Melbourne should be able to make do with even less if you use Salt's logic. On the contrary, people living in environmentally friendly single dwellings with front and back yards should make them an insurance against declining living standards and keep them. We need to save our suburbs from high density living and family-hostile apartments. The magnanimous plea from the Committee of Melbourne that older "empty nesters" help young families by moving out and letting developers in is ironical for the fact that they themselves are living in leafy suburbs with large houses and blocks! What morality have they to impose such ideas when they are only interested in lining their own pockets? Single houses with front and back yards should not be assigned to history! They are part of our heritage, and symbol of the Australian way of life - the back yard clothes line, the BBQ, the playground, vege patches, gardens, entertainment, privacy etc etc. By expanding our urban boundary, by accommodating higher density housing and covering green wedges, we are allowing more people from interstate and overseas to add to our population. There must be a limit, and housing is our right. We don't want to end up like Sydney - a city ruined by overcrowding, lack of infrastructure, and congestion. The idea of older people being lured to give up their homes, their lifestyles, their property, for the benefit of those wanting the convenience of living near schools etc covers the real reason - profits! While Andrew MacLeod and the Committee of Melbourne ostensibly are interested in community welfare, they are really interested in profits from the property market. Many older families have adult students and children living at home now, due to being displaced - refugees - in their own city. How are young people supposed to ransom their lives, their futures, for half a million dollars to buy a home? How are families meant to live in apartments? Those pushing for growth, for the "benefit" of accommodating people, are themselves feathering their own nests, but expect the rest of us to make altruistic sacrifices! We already have a new suburb in Melbourne - Fisherman's Bend. We can't keep opening new suburbs, or keep sprawling out and rising higher in the skyline! Humans are intent on eco-suicide? With so many uncertainties this century, such as peak oil, energy melt-down, climate change, erratic weather, world food scarcity, why are we depending on population growth and property development for our economic survival? Subject was: downsizing - Ed. I think it is unfair of the authors of this blog (and the H-S) to misrepresent a policy position and to needless scare older Australians. The idea of Committee for Melbourne is NOT to force anyone anywhere. Indeed we suggest the application of a policy currently operating well in Canberra and apply it to Melbourne. This idea is about removing disincentives for people who chose to downsize. Also, Committee for Melbourne is NOT 'promoting faster growth'. We are indeed encouraging SLOWER growth. We had a population growth spike of 2.2% in 2009. Melbourne's 50 year growth average is 1.65%. Committee for Melbourne's estimation - to plan for needed infrastructure - is to decrease (that is right DECREASE) that to 1.4% pa. If you people treat people who agree with you, like you are treating me, then ask yourself how you will achieve your goals. Mary Drost knows all of the above. I don't quite understand why she doesn't listen to it. How magnanimous of Committee of Melbourne! To slow growth and not FORCE older people out of their homes? Older people like their family homes, their gardens, being close to amenities too. Even if they want/must downsize, why should their homes become development sites - as would be likely? Considering that those promoting growth are comfortable in leafy suburbs, and mansions, why shouldn't they enjoy their homes without being manipulated by guilt? Andrew MacLeod can't understand why Mary Drost doesn't listen? Its because even at 1.4% per year growth, we DOUBLE our numbers every 50 years! How's that sustainable on a shrinking planet and declining Victoria? As Al Bartlett said, people have an evolutionary inability to comprehend exponential arithmetic. Housing affordability - and all the other "shortages" we hear about - would be solved by population stability, and a sustainable economy - not one addicted to misanthropic and unsustainable growth. •	The Federal politicians are talking 1.5%. CfM is not promoting growth. But we do guess where our population will be and plan our infrastructure for that population so that we remain economically, socially and environmentally sustainable. We believe that the greatest threat is unplanned future sprawl and congestion. To plan for the future and avoid sprawl and congestion you need a best guess at where population will be.... it may not be where you WANT it to be, but you need to guess where it will PROBABLY be. We estimate a 1.4% growth – slower than all of the above rates - ie CfM is estimating SLOWER growth. Ask yourself is it good for democracy to abuse those who do not hold EXACTLY the same opinion as you do? We get labelled as ‘big growth big business’ even when a lot of our members are not for profit community groups, educational institutions and the like. Many on your site have labelled me a ‘big business fat cat’. Why make personal attacks when one look at my profile shows that this is far from the truth: http://en.wikipedia.org/wiki/Andrew_MacLeod. Since when is an aid worker a fat cat? I am interested in debate, if people are interested in hearing a diversity of views. I am happy to meet anywhere anytime if people are interested in genuine dialogue. Albert A. Bartlett is Professor Emeritus in Nuclear Physics at University of Colorado at Boulder. "The greatest shortcoming of the human race is our inability to understand the exponential function." - Prof. Al Bartlett. A population growth of "only" 1.4% seems very small. However, it means, at this rate of population growth, a DOUBLING of numbers every 50 years! While our States keep accommodating this growth, with people flooding in from interstate and overseas, the growth will continue. The Federal government makes political decisions on population growth through immigration numbers, and by encouraging babies with the "baby bonus". The States then must bear the burden and ask for corresponding funding. Doubling our population in 50 years is a tremendous ask, and the environmental, social and economic costs are excessive. The infrastructure required means burdening taxpayers and rate-payers with the costs of growth - when it is contrary to our interests. It's a Ponzi scheme that promises wealth and prosperity, but in reality shuffles wealth out of the hands of normal families and individuals into the hands of the elite and privileged. While the State continues to accommodate growth, through "planning" urban sprawl and high density living, it means that growth will continue. We need to have an insurance, a buffer, against such growth and stop accommodating it. There needs to be qualifications of residency to buy property in Victoria. As for the Committee of Melbourne being "not for profit", this may be so. However, the members certainly are interested in everything else but "not for profit"! They are taking advantage of politically decided growth by accommodating it. Planning would be actually possible with population stability, but instead is being made into an excessive task. • The Federal politicians are talking 1.5%. In my opinion your objectives fail at the first hurdle to be economically, or socially or environmentally sustainable. Even the State of the Environment Report Victoria, whilst failing to stop the government's dangerous social and built engineering activities, shows that further population growth and development drives massive damage to our natural and artificial environment. Your Committee is not a product of democracy and seems to reflect only elite and economic opinion, which heads of charities etc appear to fall in line with. You may not have thought of this or have wanted it. I don't know, but that is what you seem to be in charge of. Candobetter.net is a website for reform in democracy, environment, population, land use planning and energy policy and we believe that the greatest threat is politically engineered population growth. We want to avoid the problems of more sprawl and congestion, planned or not. We know that the drivers of this sprawl and congestion and much of the 'planning' for it are private profit by the growth lobby. We estimate a 1.4% growth 1.4% growth – slower than all of the above rates - ie CfM is estimating SLOWER growth. I think you are getting pretty mild criticism, which you are well able to respond to. I think that the public however feel that they are being massively abused by the processes of unwanted and politically engineered population growth and overdevelopment; that they have no public voice and no established political process to force democracy on the government and its contractors; that the mainstream media are part of the problem, and that anyone who supports or facilitates these processes is not on their side. The Committee for Melbourne's view is supportive of radical social engineering through forced population growth in Australia. So there is no question of failure to tolerate views not EXACTLY in agreement. The question is of massive discordance and of candobetter representing public protest against effective oppression, suppression and coercion, in my view. The issue here is democracy. We don't have an effective one. With both major parties, and even the so-called Greens, supporting population growth against community wishes, and a corrupt media-system picking and choosing which parties they support and discouraging independents, the community has no effective voice. If the Committee for Melbourne were really representing Melbourne, it would be protesting against this undemocratic population growth. What it looks like to me is that the Committee for Melbourne is falling in line with the Growth Lobby by treating demographic trends as if they were demographic forecasts. They are then being published by the ABC, and the Murdoch and Fairfax media as if they were managing an inevitable and disasterous process. The only thing that could possibly become inevitable and disasterous is the failure to respond to community demands to halt the artificial stimulation of population growth. In this I believe that the Committee for Melbourne is derelict (or would be if its function were to represent public wishes) and its name thus appears ironic. Here again I will refer to my thesis, The Growth Lobby and its Absence, Chapter 6, which shows the role of such groups and public institutions in the land speculation which led to massive bank crashes in the 1890s. It is very unfortunate, in my opinion, that charities, churches, schools and universities, invest in property rather than put their funds into providing shelter for the poor, because their investments fuel the speculative cycle and the charities etc become part of the problem that they purport to solve. High costs of land and built property are the major driver of high costs of doing business and our poor competitiveness on the global market where we are obliged to compete with countries with much lower land and housing costs due to their saner and more democratic land-use planning and development systems with lesser population growth. Only large corporations (usually owning many landed assets) benefit from this aberrant system. Ordinary people and small business (including agriculture) go broke due to erosion of their margin. For charities and not for profit groups to support such a system is, in my view, for them to support poverty. If they are sincere, they should pull out of any group that in any way supports this system. If, however, they are putting pressure on the Committee to stop supporting this corrupt process, then good on them. I agree with James Sinnamon's comment, which is that we have published all your comments; there is actually nothing fettering your opinion, but we will also publish arguments against what you say. Our site represents democratic views which are suppressed or ignored by mainstream media and government and which are not adequately represented through our parliamentary system. I have to say that James Sinnamon is so democratic that he sometimes makes me angry. He has permitted people to abuse me and he has encouraged debates when I would have, left to myself, prevented them from continuing. James Sinnamon is the strong moral force that makes this site such a good and popular one, for any imperfections, even if I do not always agree with him. I must add also that the mainstream media is so unrepresentative that candobetter.net had to be invented. I have already dealt with the question of the investments of charities. With regard to aid workers, there is a lot of literature that is critical of them and of the role of aid organisations. I think I will address this question elsewhere. I will consider this invitation. We will look into possible venues and options. In the mean time, however, this is a debate already and I thank you for entering it. A decrease in population growth rate is NOT a decrease in population. It's a decrease from the boosted rate of 2.2% in 2009, due to Kevin Rudd's "big Australia" push. In their first year, newborn babies grow a big way, with most tripling their birth weight and increasing their length by about 50%. However, this rate cannot continue. There are limits to growth. Bigger is not necessarily better. No species, or natural community, can continue growing indefinitely. Growth is only one stage of a life-cycle. Melbourne may have grown fast in the past, doubling in 50 years, but - like living vertebrates - the bone structure (infrastructure) would fail ultimately, and shorten lifetimes. I want to remind Andrew MacLeod that he says he is planning Melbourne for 8 million people and that I heard him say at a public forum that we have to increase the population otherwise how do we pay for the infrastructure we need. In addition he said as quoted in the Herald Sun that he was "appealing to the MORAL SENSE of emptynesters" to leave. I mean moral sense. So it is a moral issue to quit your house?. Further he says 'they SHOULD be encouraged to downsize for SOCIETY'S SAKE'. Does Andrew MacLeod have the moral sense to realize what effect his words have had on some of the seniors who have been calling me on the phone? How vulnerable it makes them feel? Andrew MacLeod should realize that we are not a communist state. Further editorial comment: Mary Drost's words are borne out by the content of the following newspaper article: Call for elderly to give up homes (page 1, page 2, all). See also: Lobby group calls for older couples to give up family homes, Melbourne set for eight million people in 2051, Time for Melbourne to think about its population surge. In the poll incorporated in the the article Melbourne set for eight million people in 2051, 76.79% of respondents or 1019 said No, Melbourne could not handle 8 million people, whilst only 23.21% said Yes, Melbourne could handle 8 million people. The Committee of Melbourne's plans to impose massive population growth on Melbourne is clearly opposed by the overwhelming majority of Melburnians. The majority would be even more overwhelming if so much pro-population growth propaganda were not pushed down our throats by the daily newsmedia, politicians and lobby groups such as the Committee for Melbourne. How can population growth reduce unbuilt infrastructure backlog? The article Time for Melbourne to think about its population surge reported that a Committee for Melbourne report to be released on that day, 19 October 2010, "highlights a $100 billion backlog of unbuilt roads, rails and ports in Victoria that is getting worse by the day." If Victoria's population had been stable for the last twenty years, instead of growing as it has grown, could the backlog of unbuilt roads, rails and ports be anywhere near as massive? It seems far more likely to me that today there would not be a backlog at all. What we had built in the past, would most likely be serving us well today, with only a need on our part to maintain the infrastructure and occasionally make repairs. It would only have been necessary to build new infrastructure when the old infrastructure had worn out with old age. It would have been possible to keep our economy running with everyone's needs being fully met with a shorter and shorter working week instead of what we have now, where everyone is compelled to work longer and longer hours to pay for higher living expenses (housing costs inflated by population growth, most of all), government taxes to pay for new infrastructure or, alternatively, tolls and other charges that private corporations have been all0owed to impose on us by the Victorian Government. How could we expect not to become more indebted and more enslaved if we allowed our population to keep on growing as the Committee for Melbourne would have us do? Infrastructure shortages are hampering the growth of New South Wales, claimed Opposition Leader Barry O’Farrell at the Property Council of Australia's (NSW) Great Growth Debate, held last year in Sydney. It's the people who vote who need to pay the costs of infrastructure, and public pockets are not a limitless resource. At the same time, the argument is that we need population growth to grow our economy, to provide the taxpayer base needed to fund our ageing population and to sustain the manufacturing and service industries that our country should have. Simply put, if we want to live in a First World society, with all its benefits, we need more taxpayers to fund it. We end up with a cyclic, unending argument. We need infrastructure, so we need more immigration to provide the taxes, and inevitably we end up with more "shortages" of infrastructure that in turn means we need more population to pay for it, and the skills to build it all! With all this growth, we end up with more "ageing population" and thus need more young immigrants to compensate. We are trapped in a myopic cycle of growth, shortages, a need for funds, thus add a few more people, ageing numbers increase, more infrastructure needed and more people! It's a vicious, misanthropic cycle of decline and artificial revival that will lead to a depletion of natural resources that won't end until the growth-lobby and government elite come out of their ivory towers and face the real, and finite, planet. Editorial comment: Thanks for this insightful response to my comment, Enne K. Still, I think it needs to be pointed out that the "vicious cycle" is largely an illusion conjured up by politicians, the Growth Lobby and the newsmedia to further their own selfish ends at the expense of the majority of people and future generations. Any Government, with the will to serve ordinary people and not wealthy vested interests and which was prepared to apply itself diligently, could break this cycle over a short period of time. The conventional economic wisdom is that: "Simply put, if we want to live in a First World society, with all its benefits, we need more taxpayers to fund it." Economists accept that the stability of developed countries depends on continual economic growth and consumption. However this is clearly not possible on a planet with finite resources. Many contemporary governments believe employment and wealth are created by continuous economic growth and consumption and that these are fundamental to electoral success. Political lifetimes are short, and so is political accountability. Short-term benefits are the key to short-term "successful" policies. The fundamental problem with this ethos of continual growth and consumption is that it ignores the biological principle that all living systems will grow until limited by the constraints of food and resources. No natural species or natural communities can continually grow! Humans aren't an exception. In a study: Relationship between Growth and Prosperity in 100 Largest U.S. Metropolitan Areas by Eben Fodor December 2010, the annual population growth rate of each metro area from 2000 to 2009 is used to compare economic well-being in terms of per capita income, unemployment rate, and poverty rate. The study found that faster growth rates are associated with lower incomes, greater income declines, and higher poverty rates. The 25 slowest-growing metro areas outperformed the 25 fastest growing in every category and averaged $8,455 more in per capita personal income in 2009. The findings raise questions about the efficacy of conventional urban planning and economic development strategies that pursue growth of metro areas to advance the economic welfare of the general public. Scandinavian countries have small, stable populations. They don't use their mineral wealth for day-to-day expenses: Norway saved its oil bounty, of which roughly half the profits went to the government and was put into their equivalent of a 'future fund'. They are wealthy countries that defy the expansionist mantra we hear so much in Australia. A stable population would allow a more measured and sustainable use of resources and processes, and thus our future can be planned and so can sustainability. On the contrary to Make Poverty History, we need to Make Wealth History. Under our current system, there are disastrous job losses whenever the economy goes into recession. It’s an inherently unstable system that is guaranteed to deliver a jobs cull every ten to twelve years, until it eventually runs out of steam altogether. The transition may be rocky, but a steady state should be much more stable in the longer term. On a brief visit to Christchurch about 2 years ago I noticed in the suburbs the attractive modest low slung bungalows with front and back gardens. Since the earthquake a few days ago, the sewerage system throughout the city has broken down- I suppose it is only as strong as its weakest link and I'm sure there is massive damage in many places . In a televised interview with the deputy mayor last night she made this situation explicit and was asking citizens to dig holes in which to bury their toilet waste. Relevance to Melbourne? A significant earthquake is unlikely in Melbourne but only last month after continued heavy rain the Melbourne sewerage system was under so much stress that its contents were released into the local waterways and made its way to our bay swimming beaches. Had the water authority not done this, sewage would have backed up and been returned through people's bathrooms. Furthermore raw sewage was seen on the grass of a local park near where I live having burst through the lid covering the system. High density high rise living leaves no flexibility when systems are under stress. At the very least a backyard enables some way for people to process waste in an emergency. "Are we not constrained, or coerced, by many things in life that lie outside the dictates of government? Are we not constrained or coerced by resource shortages, traffic congestion, poor air quality, expensive housing and all the environmental baggage of overpopulation? Has not the sum total of private procreative decisions presently deemed to be the province of sacred and inalienable ‘human’ rights proven to be more coercive than the most draconian of any government’s birth control laws?" The Herald Sun misquoted - and Mary knows this. What the Committee for Melbourne suggested was Stamp Duty relief and tax cuts for the elderly. We never suggested forcing people out of home - never. What really disappoints me is the day of the article I wrote directly to Mary. I told her that the article was not accurate. But rather than pass on to people that the article was inaccurate she went on to stoke the fear. That is unfair and unreasonable. This is what I wrote to Mary is below so you can all see. When my grandmother wanted to move to a care facility (I stress when SHE wanted to use her right of free choice), one of the things that frightened her was stamp duty. Why, she asked, did she have to pay the government $150,000 in tax just to move from her house to and aged facility. She was worried about her finances lasting her life... and why should so much be given to the government. Nowhere did we say or imply people should be forced to move and for Mary to spread that message when she knew it was untrue is the hight of fearmongery.. The policy we suggested is the one which is working well in Canberra is about providing choice and removing the fear that my grandmother had. See: http://www.revenue.act.gov.au/home_buyer_assistance/pensioner_duty_concession/1_January_2011_-_30_June_2011 . If people want to stay in their house that is fine. But if people want to downsize (as many chose to do) it is a community benefit - so why should we slug them tax? Well fine, we take it off the agenda. Think on that when you pay the stamp duty if you chose to move. We would have had this policy up if not for you Mary. I just thought I’d drop you a quick note to clarify the impression in the newspaper. The Committee has never suggested, and never would suggest, that people should be forced from their homes. What we have said however is that we believe we should examine stamp duty relief to encourage those choosing or thinking of choosing to downsize. Surely it would have been more appropriate to have written to the Herald Sun if you felt misrepresented? Feel free to publish a copy of any complaint you send them on these pages. In my opinion exploitation by the growth lobby of the 'issue' of an aging population is fearmongery and Mary Drost is only standing up to it. She is not a paid executive but is performing a public service. In that function she belongs to a group of courageous Melbourne women, some of whom I have written about here: Anti-Growth Lobby: Women in politics: why don't more participate - or do they? (Melbourne, Australia) People are right to be afraid of any changes to policy on their right to shelter and to defend their homes in a system where Australian built and undeveloped property has been thrown open to almost anyone in the world able to compete on the global market with superior currency. This is undermining our access to affordable shelter and it is undermining our democracy by placing some people and businesses in a position to affect public policy beyond the ability of our deficient democratic system to represent its citizens' interests and voices. Many people would dispute the statement that downsizing is a public benefit. Some important arguments are loss of trees and their social and environmental benefits; difficulty in reorientation for elderly people who do fine in their old environment, but cannot manage to recognise new places effectively; loss of social contacts; reduction of social diversity; loss of normal local political contact. There is also, of course, the problem of excessive use of fuel and building materials in constructing new buildings and roads (greenhouse gas production is huge in the housing industry as is draw-down on petroleum reserves). Increase in development intensity places pressure on housing prices and on good-neighbourliness by making money more important than shelter. Development intensity also drives up the costs of rates and services and lowers the standard of ammenity. Infills literally form wedges in natural social and political organisation at the local level. The private property development system in Australia, America, Canada and Britain has created an elite cast of professional beneficiaries who are able to fund peak bodies to amplify their interests and their access to government, a process which has eroded democracy. Artificial management of the built environment over and above the heads of those who live in it is also an abrogation of democracy. My article criticises a view of society as cohorts to be organised by remote corporate style management, supported by corporate media, in the absence of effective democratic representation. Policies like this should be carefully investigated in a truly democratic process, like all policies affecting shelter, food and other basic rights. Unfortunately organisations representing or allied with the commercial property development sector have gained political power without democratic representation of citizens. I am glad that Mary Drost is providing a voice for the community and for elderly people especially, who, we note, have contacted her and thanked her. With regard to stamp duty, we have previously observed on this site that the Victorian government is excessively dependent on stamp duty and that this is a driver of inappropriate and unwanted population and development growth. Unfortunately property industry advocates, when they reduce government charges, usually find a way to divert that money to themselves. An example of such diversion of public money is where the introduction of housing subsidies in an inflated market only serves to drive prices up further and is a case where taxpayers are forced to subsidise hated population growth and property development. It is a sign of a corrupt system which needs to be replaced. In Europe there is healthy low-priced public competition in development and construction which keeps the price of private development and construction down. That is what we need here. We need to reduce private property development to a fringe industry and introduce rights to housing as rights of citizens. I have gone into this in Chapter 7 of my thesis, The Growth Lobby and its Absence, which is available here: http://adt.lib.swin.edu.au/public/adt-VSWT20060710.144805/index.html. This thesis contains three literature reviews: environmental, land-use planning and population and it compares two different political systems and their effect on population policy and response in this to the first oil shock. It also contains a history of the growth lobby (Chapter 6) in Australia, from early times. Andrew, you may appreciate more where I am coming from if you have a look at this. For those of you who lament the lack of quality debate remember the old saying "i may not agree with what you say but I will fight to the death for you to have the right to say it'? the fundamental tenant of democracy is to allow the expression of free opinion. And here you are publishing a private persons private address and encouraging people to make vigilante attacks? Where have I encouraged people to make vigilante attacks? I cannot find a basis for your accusation, Andrew. I agree with Voltaire's statement and that the fundamental tenet of democracy is the expression of free opinion, but another fundamental tenet is that government take heed of that opinion. Unfortunately we live in a system where the mainstream media, like the pulpits of old, chooses whose point of view it publishes and its choices are not guided by democracy, but profit and status and this media also dictates the governments we get. Andrew McLeod is entitled to make his comment but we are entitled to educate the public on how Mr Salt lives when Mr Salt makes his living from telling the public how they should live, to their disadvantage. Bernard Salt has, like the late Richard Pratt, with the blessing of the public and private commercial media consistently marketed against people having gardens and houses and preserving their way of life, yet he himself has that way of life. The fact that he has a house in Camberwell (the kind of leafy suburb he has frequently deprecated) shows this dramatically. He is a citizen with huge influence, but most citizens have no influence because the mainstream media magnifies the voice of big business. This commercial mediatised star-system that anoints corporates with authority is eroding our democracy and one of the by-products is rising cost of living, falling small business profit margins, loss of affordable housing, ammenity and security. Candobetter tries to change this. The hugeness of our populations has favoured the evolution of a kind of feudal top-down management of the rest of us and has removed the natural democratic ability to look in the eye a person who proposes to inflict unwanted change on a community. Salt is a public figure like a politician. Politicians have to publish their addresses, as responsible members of the community in one of the few democratic rules remaining in our system. 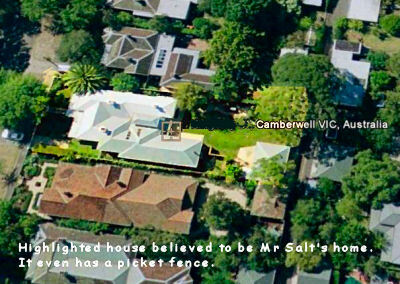 I have justified publishing a picture of Salt's house by the relevance of that information to democratic concerns about living standards and democracy directly related to what he was advocating in the article in the Herald Sun. I also think that the public should be able to easily contact a person who has such influence over their well-being to seek dialogue on an equal basis. I have not, however, provided information that would permit them to do that, as much as I think it would also be relevant at this stage. After discussion, in order to show good faith, I have also removed the name of the street from the picture. James Sinnamon was particularly keen to show that candobetter.net supports such an action to show good faith. Please excuse length and repetition in this response. I have a sore throat and there were a lot of comments of a similar nature requiring responses. Bernard Salt's message in his talk on February 12th at the Boroondara Community summit , Hawthorn Town Hall was crystal clear: it would be great and in fact would a community service if empty nesters and widows in the municipality would sell up and leave their homes to make them available for younger people who could avail themselves of the local amenity, especially schools. The strategy appears to be to target ordinary home owners in a campaign to get a lot of movement of property. The technique used in the talk was to illustrate the idea using the iconic "brick veneer" and the repeated image was of a widow "rattling around" in it. "Brick veneers", essential to the lexicon and repertoire of humorist and entertainer Barry Humphries are ordinary houses mostly built in the 1950 and 1960s that everyone used to be able to aspire to but their $ value especially if they are within striking distance of any amenity or service has made them expensive. This is because of the intense competition for housing especially in established Melbourne suburbs due to massive population growth. Salt's focus on the "brick veneer" is a bit like tax- you need to target the masses to get the maximum result. The "brick veneer" rather than the architect designed or historic Edwardian or Victorian homes are symbolic of and house ordinary Australians. An idea illustrated with a visual image -"widows rattling around in brick veneers" is apt to be repeated and get into the vernacular. Eventually those who put out this propaganda don't have to do much more work on the idea on behalf of those they represent. The people themselves, receptive to what they are told take it up as a truism. This is what happened with the suburban backyard. About 20 years ago opinion articles in the main newspapers appeared, moralising about how Australians need to live more compactly and relinquish their love affair with the backyard. A backyard is a very ordinary image. Lots of people had them or aspired to have one complete with "Hills Hoist" (an umbrella shaped outdoor clothes line installation). I noticed soon after the articles appeared in the newspapers that people would parrot this as part of their social exchanges! It became the thing to say at dinner parties after people had exhausted the tedious topic of house prices. To them, somehow, it didn't quite mean they themselves had to move on immediately, but someone else could! This is, in fact, the real "NIMBY", when you unthinkingly latch onto an odious idea and embrace it on behalf of other people. If it was an ethnic or racial group being vilified for their type of house, or for "rattling around" inside it, there would be an outcry of racism, xenophobia and discrimination. However, because the attack is on middle class mainstream Australian widows, they are open for ridicule and derision. They have a right to live in their homes, the homes of their families, their memories, and enjoy the amenities previous generations took for granted. Why should the builders and developers manipulate guilt for their own purposes? To say that Melbourne is low density is good as it allows liveability, parklands, backyards, gardens, trees, pets and nature strips. Having a "brick veneer" with all the trappings of 1960s icons such as Hills Hoist etc is reverse discrimination - it is saying that they should be made available for the pool of young migrants coming into to Victoria from overseas who will add more to the economy are preferred. Older widows from traditional Australian backgrounds should thus move on and make way for "progress". Fragmenting our society, and replacing original Australians with "diversity", helps the breakdown of democratic debate, cohesive communities, and allows government-supported groups to push unpopular agendas onto a more compliant and "fresh" public. This is a good place to post something that proposes itself as research, yet is clearly propaganda. The authors actually insist that "Population growth is not a project driven by the business lobby or politicians." How ridiculous does that statement look here? It's a classic. Teachers should use it in primary school as an example of unclear thinking and bland misinformation with the usual biased bogies - shrinking European population [sensibly getting ready for petroleum decline] vs vibrant multiculturalism [40m under poverty line in the US and growing homelessness in Australia??]. "Why a Growing Australia is Nothing to Fear." A growing population presents us with challenges and opportunities. Population growth, and the skilled migration that fuels it, helps our economy grow - giving us the resources to support our ageing population, build better infrastructure, and protect our environment. A growing, pluralistic society makes us socially richer too. Jessica Brown is a Research Fellow in the Social Foundations Program at The Centre for Independent Studies. Fair Dinkum Researcher. I sympathise with you non-growth lobby researchers. No-one funds you. Thanks for drawing attention to Hartwich and Brown's lobby-serving froth. "A German researcher says there's no merit in arguments that immigration will lead to the collapse of Australian services and infrastructure. Dr Oliver Hartwich, a research fellow at The Centre for Independent Studies in Sydney, is one of the authors of a new report on population growth and its implications for Australia. Dr Hartwich says the negative arguments currently dominating the debate on immigration are a cover for government policy failures, and the product of what he calls, an immigration fear culture." What a patronising piece, eh? No merit in the argument that "..immigration will lead to the collapse of Australian services and infrastructure". The Ponzi economics of Australia means that the costs of infrastructure are a prohibitive bottleneck to advancement, and rising, along with the costs of living. Germany has the world’s third most powerful economy, with its free-market system tempered by generous welfare benefits. Germany's affluent and technologically powerful economy is the fifth largest national economy in the world. Germany has one of the world's most technologically advanced telecommunications systems as a result of intensive capital expenditures since reunification. Germany experienced an economic boom immediately after unification. Germany, not the United States, is the world's biggest single exporting nation. The German chancellor announced early in April plans to boost state-controlled day-care facilities in the hope of boosting the German birthrate, one of the lowest in the world. Germany's population is characterized by zero or declining growth. While most of their migrations had an economic background, Germany has also been a prime destination for refugees from many developing countries, in part because its constitution long had a clause giving a 'right' to political asylum, but restrictions over the years have since made it less attractive. The new German Immigration Act, which came into force on 01 January 2005, provides for highly qualified persons to be granted permanent residence and permission to work from the outset, rather than five-year work permits as was previously the case. They must have a concrete job offer and get permission from the German Employment Agency. This is hardly the mass immigration Australia has - encouraging students, family reunions and basically having universities relying on foreign income to subsidize their existence. Germany would prefer to stay the more powerful nation, for their own interests, and have Australia strangled by greed and population obesity as the result of our Ponzi economics.